Our proposal creates a major urban ‘room’ serving as an interface between the town centre and the main boulevard. Based on the analysis of pedestrian flows, both real and desired, our proposal transforms a difficult uneven site condition into a new covered plaza/event space for the city. A sloped ground plane connects the uneven boundary conditions by uniting them into a continuous surface. The sloped surface globally provides seamless connections while being locally manipulated by specific ‘urban forces’: entrance and exit points to an underground garage lift the surface while the desire for a more direct route to the alley way leading to the center from the boulevard ‘force’ the ground plane down to provide seamless connections at several points. 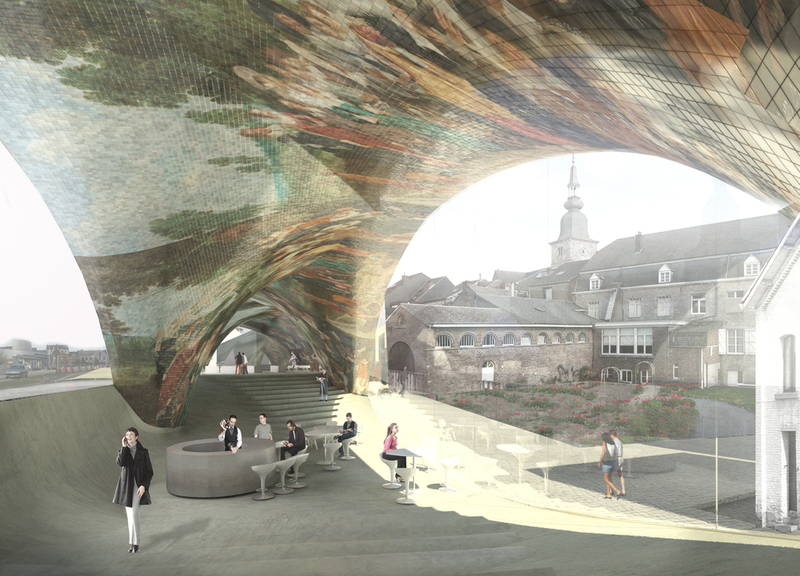 A series of arches support a bar of housing units above and a public program on the roof. The large arches efficiently support the program above while doubling as private staircases to access the housing units. The feet were carefully located and optimized through structural analysis while permitting certain urban connections open. A vierendeel beamed structure provides an open and efficient structure which rests upon the arched feet below.